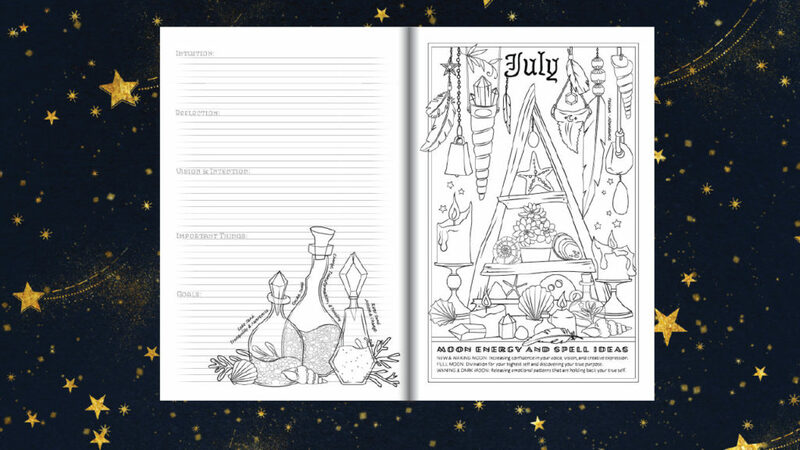 Blog Planner for a Magical 2019 - Full Preview Video & Release Date! 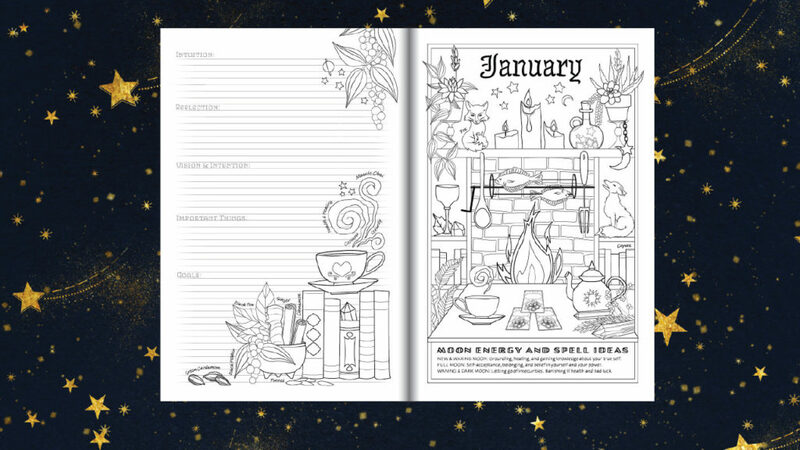 Watch this Planner for a Magical 2019 Full Preview video (with Author Commentary! ), or see a few photos below. The release date is September 22, 2018, and I’ll post the links to buy and more info over here on this page. Thanks for checking it out, hope you like it! I have the 2018 and have enjoyed it so much. I will be getting the 2019 also, I love it!!! I dont just want I need this book it is amazing. Love you dairy! I know it’s a slim chance but is there chance of getting one with the season different for us here Australia? hi Kit! I put it in the email but forgot to put it in the blog 🙃✨ I am planning a Southern Hemisphere version, but with just a little later release date-October/November. I’ll send a link to be notified for it in my next email. Screeching loudly! I love this new planner! So beautiful! Cannot wait! 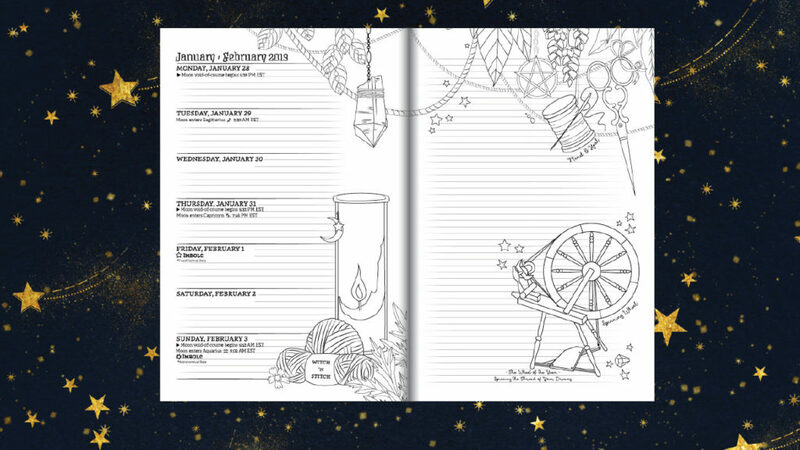 I absolutely love my 2018 planner so will definitely be ordering this! Looks fantastic! 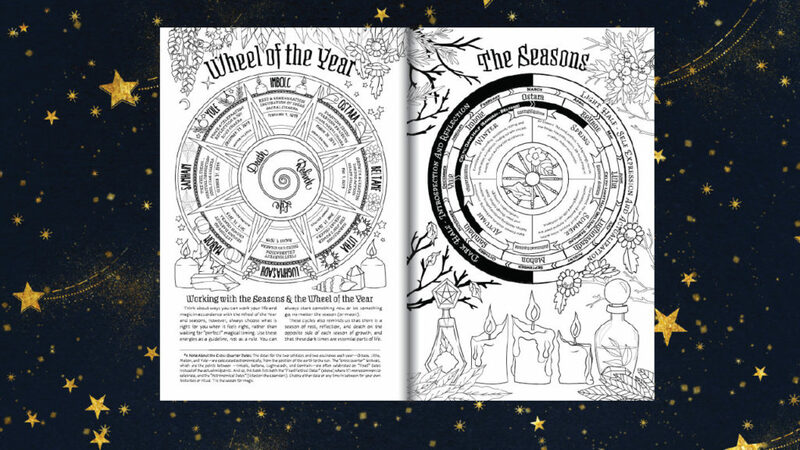 I’m looking forward to another fun year of coloring while I follow the seasons and events of my year. Absolutely love this. Such beautiful artwork. I cant wait to to get one. so glad you like it, Margarita! Thanks a lot! I wish, but unfortunately not! It might be up a little early, tho. We shall see! This looks fantastic! I definitely want one. Do you know yet what the price will be? Mostly! Sorry I always forget this part. Spiral will be $22-23 ish on Amazon US-maybe a little more, maybe a little less. I still have to do some math on that one. The spirals are expensive to make and super expensive/kind of hard to get onto Amazon, unfortunately! I will have the spirals on Lulu.com w/ very affordable shipping worldwide, probably for about $18. I live in Cuenca Ecuador and will be eagerly awaiting the Southern hemisphere version. Can you send me an email when it is ready? Thank you for doing this. hi Sharon! In my next email, there will be a link to click and be notified for southern hemisphere! Every thought of making planner stickers for say um happy planner? I would love to integrate the two planners. aww thank you! I have thought about stickers, just not quite there yet xox 🙀📜🖌 Maybe in 2019! 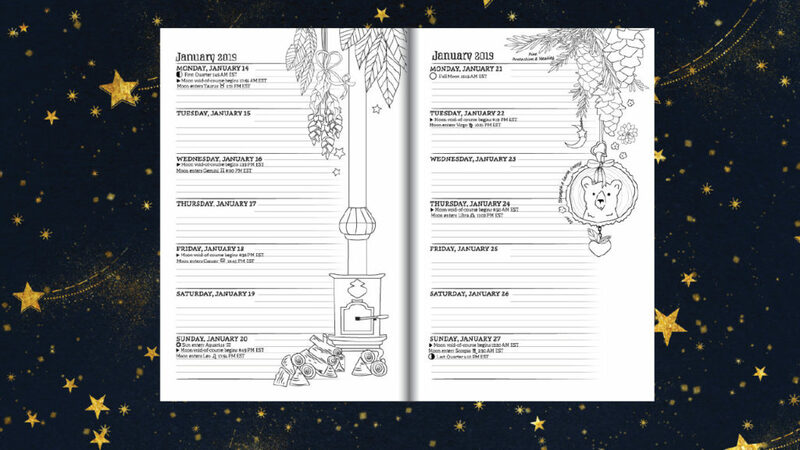 OMG this is the best planner so far I’m loving all the new artwork can’t wait to get my hands on it thank you Amy for your talent and inspiration. Awesome! I can’t wait to request this as a Yule gift! I’ve been enjoying the 2018 one! hi Laura! I put it in the email but forgot to put it in the blog 🙃✨ I am planning a Southern Hemisphere version, but with just a little later release date-October/November. I’ll send a link to be notified for it in my next email. I’d like to see the Southern Hemisphere version! thanks Jordania! I’ll try to get a video together of that once it’s ready! aww! I know, it’s SO different, too! Kind of crazy to plan it out! 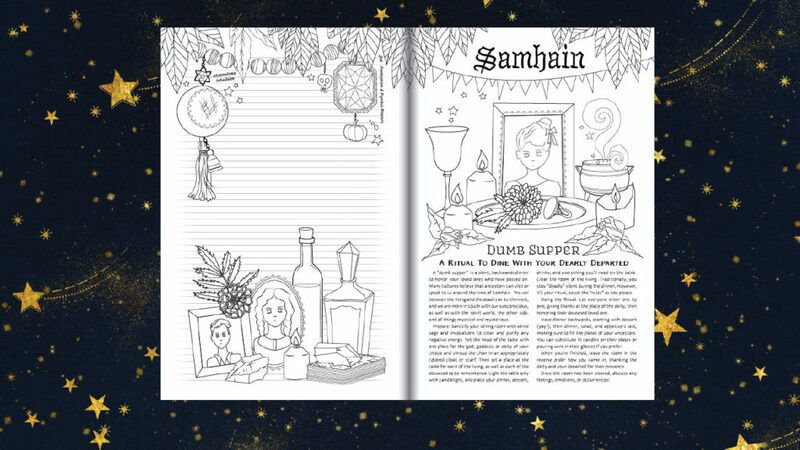 xo Tell me also if you want some “Halloween” stuff in October as well as the seasonal Samhain pages switched to April. I can mix it up a little for those holidays that are more commercial! you’re super welcome, Susan! I’ll have more info about the Southern Hemisphere version soon. Love it, might just get one for me this year, is it only on amazon? hi Angeline! 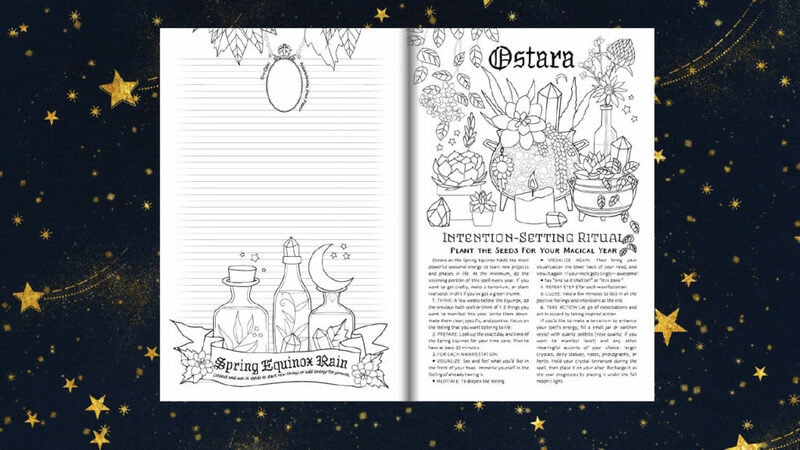 The spiral-bound version will also be on Lulu.com, and I think Barnes and Noble can order the paperback for you if you prefer to shop with them. Also, the PDF will be on Etsy. Can’t wait to get this one. These are the best . I’m looking forward to this! Quick question, when does the planner start October 2018 or January 2019? Absolutely beautiful, you out do yourself every year! I cant wait ti get my copy this year!! Gorgeous! Can’t wait to get a copy! Love it! And can’t wait for it to come out!! Thank you for the preview! Your art work is just beautiful!! I got my first planner (for 2019) the other day and I am so excited! I love it. It is exactly what I need to remind me of astrological, lunar, and spiritual goings on. Life gets so busy. I will continue to buy them as long as you continue to make them. Thank for making this wonderful planner. 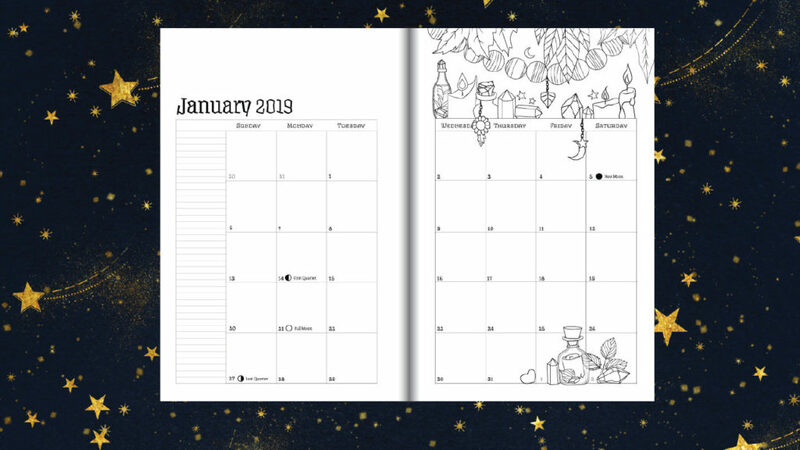 I am so excited for my 2019 planner, this will be my 2nd year with this it. I also have the composition book and Witch Life. Your books are a wonderful part of each day. 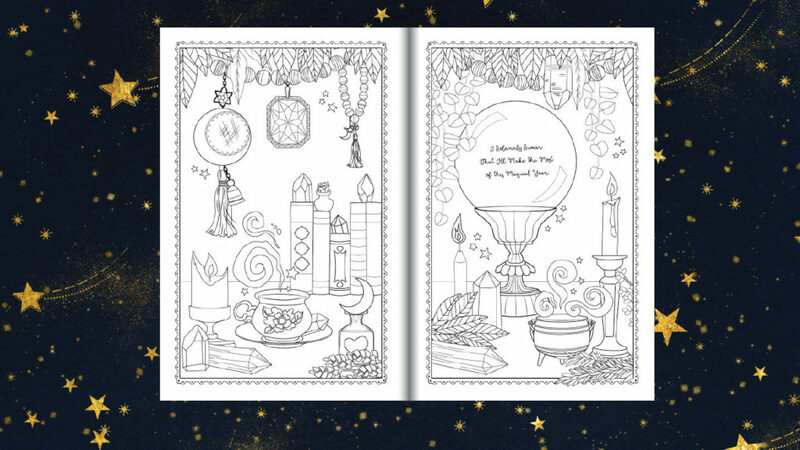 I am able to color a lot at work and it helps me do my job better and feel less stressed out at the end of the day/week. Working in a customer service call center as a supervisor can really wear some people out but I’ve found that coloring when being yelled at helps keep me mellow and patient. 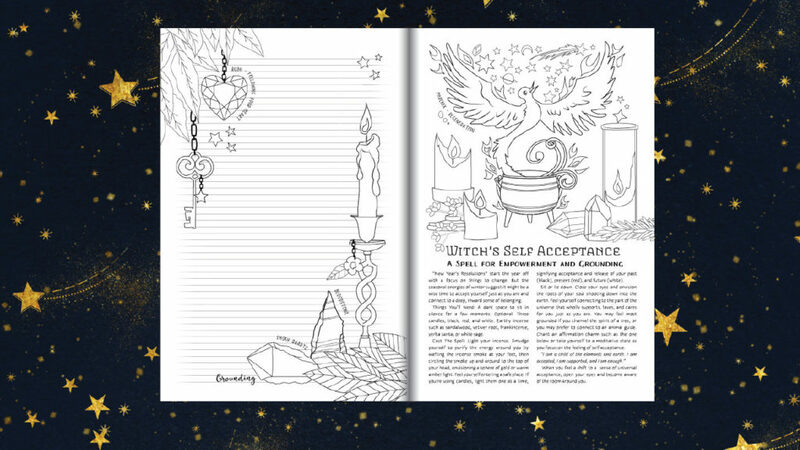 Having your books to color is an added perk, at it allows me to stay connected to my faith which grounds me. Thank you so much for all the love and time you have put into your books.